Always interested in other parts of the world, Irena Zubcevic has found the United Nations to be an amazing place to work. 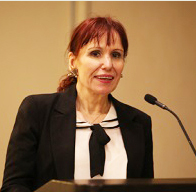 She has served the organization as the chief of the Intergovernmental Policy and Review Branch of the Office of Intergovernmental Support and Coordination for Sustainable Development since April 2018, preceded by positions as the chief of the Ocean and Climate Branch of the Division for Sustainable Development in the Department of Economic and Social Affairs and as a senior sustainable development officer. The sustainable development initiative includes 17 developmental goals that she considers to be the framework for the whole of humanity. Ms. Zubcevic’s branch recently hosted a big conference to find solutions to trash and pollution in the ocean. They are also working on public transportation in remote areas and on women’s safety on public transportation; the hope is that raising awareness of these types of problems will prompt countries to adopt policies to better the lives of their people, and through them, the world. One of the things Ms. Zubcevic loves most about her job is being able to interact with people from all over the world. She finds it an enriching experience, and feels she has grown because of it. She understands and has a deeper appreciation for different cultures and the issues they face. Over the years, Ms. Zubcevic has come to speak a number of different languages, including English, French, Spanish, and Italian, and to have a working knowledge of German and Russian. She considers a highlight of her career to be participating in a group of countries discussing how they could move forward and form a framework for everybody to be prosperous enough to economically grow and have social responsibility, gender empowerment, and protection for children and youth. They worked for three years to help countries come to an agreement on these goals, and it was really validating to see that come to fruition. Prior to her current endeavors, Ms. Zubcevic garnered experience as an adviser to the Ministry of Information of the Republic of Croatia, the head of the English News Service of the Croatian News Agency-HINA, and the minister and plenipotentiary of the Ministry of Foreign Affairs of the Republic of Croatia. Her professional designations include a Master of Science in humanities and social sciences and a Bachelor of Science in humanities and linguistics from the University of Zagreb. She also holds certification in public administration from Harvard University, diplomacy from the Diplomatic Academy of Vienna, public diplomacy from the Centre for Diplomatic Studies in the U.K., and diplomacy and counselor examination from the Croatian Foreign Ministry Diplomatic Academy. To keep in touch with her peers, Ms. Zubcevic joined prominent organizations like the International Society of Sustainability Professionals, Soroptimist International of New York City, and the National Association of Professional Women. Ms. Zubcevic shared the knowledge she’s accrued through publications like “Gateway Portals to the City: Reshaping Cities and the Urban Rural Continuum Through Gateway Portals” for the Consortium for Sustainable Urbanization, “Countries in Special Situations, United Nations 2015” for the Global Sustainable Development Report, and “Economic Diplomacy” for the Yearbook of the Croatian Diplomacy Academy.